This article is about the smasher known as Axe. For the similarly-named smasher, see Ax. Axe is a smasher from Sierra Vista, Arizona, who currently lives in Avondale, Arizona. He primarily mains Pikachu, being widely recognized as the best Melee Pikachu player as well as the best Young Link player in the world; he also uses Falco, Marth, and Fox at a professional level. Since his first national in 2009, GENESIS, Axe's play with Pikachu has drawn a lot of attention, as he has placed in the top eight of large nationals several times and has beaten many of the best players in the world with Pikachu. Axe is widely credited for Pikachu's movement up the tier list from a mid-low tier character to a solid mid-high tier character. He is currently ranked 1st on the Arizona Melee Power Rankings and 10th on the 2018 MPGR. Axe also plays Pikachu in Project M, and is considered to be one of the best Pikachu players along with Anther. Axe was picked up by Mortality eSports on July 9th, 2014, but ultimately left the team on April 9th, 2015. He was picked up by Tempo Storm alongside Westballz on July 2nd, 2015. Axe's breakout performance occurred at GENESIS in 2009, where he defeated Jman 2-1 in the second round of winners' bracket, who was considered one of the best players in the United States at the time. However, he did not make a long run after that, losing to Raistlin and then to Linguini, placing 33rd at the tournament. Axe later surprised many by placing 17th at Pound 4, where he defeated PPMD (then known as Dr. PeePee) 2-0 in winners' bracket, before losing to Mango and then to Linguini once again. Axe later attended Apex 2010 and defeated Blunted Object in winners' bracket before losing to Armada 0-2. He made a stellar run through losers' bracket, defeating RaynEX, Cyrain, DaShizWiz, and Jman before losing to Armada 1-2 in losers' quarters, ending his run at 5th place. By this time, Axe had surprised many by taking sets off of top players using what was usually considered a mid-low tier character at the time. Axe placed 4th at Pound V, defeating Colbol, Remen, and Cactuar 2-0 in winners' bracket before losing to Armada 1-3 in winners' semis. He defeated Hax 2-1 in losers' quarters, with a 3-stock victory in game 3, before losing to Hungrybox 0-3 in losers' semis. Axe did not perform as well at the nationals he later attended, although he was still able to hold his own against top players. He placed 17th at GENESIS 2, losing to MacD 1-2 in the first round of winners' bracket, and then defeating PewPewU 2-0 before losing to Shroomed 0-2, and 33rd at Apex 2012, losing to StriCNYN3 1-2 in the first round of winners' bracket, and then defeating Linguini in losers' bracket before losing to Darc 0-2. Later in 2012, he placed very highly at MELEE-FC10R Legacy, where he reached 3rd place. At said tournament, he made it to the final round-robin bracket, where he defeated SFAT 3-0, Kage 3-2, Kels 3-1, Darkrain 3-1, and Hax 3-1, but lost to Hungrybox 0-3 and Mango 0-3. He once again placed 3rd at Kings of Cali, where he made a long run through losers' bracket after losing to Westballz 0-2 in the third round of winners', defeating Lucky, Fiction, SFAT 2-1, S2J 2-1, PewPewU 3-0 (with a 4-stock lead at the end of game 3), and Shroomed 3-1, before being taken out by PPMD 2-3 in a last game, last stock situation in losers' finals. At Apex 2013, Axe defeated G$ and then S2J 2-0 in winners' bracket before losing to Overtriforce 0-2. He then took out Tope and JAVI 2-0 in losers' bracket before losing to Hax 0-2, placing 9th. He also placed 7th at Kings of Cali 2, losing to Fly Amanita 2-3 in winners' quarters and to SFAT 2-3 in losers' top 8. At EVO 2013, Axe defeated Reno 2-0 and Bladewise 2-0 in the winners' quarterfinals pool, before losing to Mango 1-2. He then defeated Fiction 2-0 in the losers' quarterfinals pool to secure a spot in the losers' semifinals pool, where he was knocked out by Shroomed 1-2, ending his run at 13th place. Axe placed 9th at Apex 2014, defeating Zhu 2-0 and PewPewU 2-0 in the second round of pools after losing to Leffen 1-2. He was taken out by Hungrybox 0-2 in losers' finals of the pool. Axe later placed 7th at Pat's House 2, losing to Mew2King 0-3 in winners' bracket and to SFAT 0-3 in losers' top 8, and 4th at Super SWEET, defeating KirbyKaze 3-1 in winners' quarters before losing to Mango 1-3 in winners' semis, and then defeating Kels 3-0 in losers' quarters before losing to Mew2King 0-3 in losers' semis. Although Axe had previously maintained high placings at nationals, he surprised many with an extremely stellar performance at MLG Anaheim 2014 in the summer of 2014. In the open winners' bracket, he defeated Ken 2-0 to secure one of the four available spots in the championship pools. In his pool, he defeated Hax 3-1, Colbol 3-0, Remen 3-0, s0ft 3-0, and Mew2King 3-2 in a large upset, although he lost to Leffen 1-3 and PPMD 2-3. Seeded in losers' bracket in the championship bracket, he secured a spot in the top 8 by defeating Lucky 3-0. However, Axe's largest upset came shortly after; in losers' top 8, after losing the first game against Hungrybox, he closed out the set 3-1, before losing to Mew2King 0-3 in a rematch in losers' quarters, ending his run at 5th place. Axe managed to repeat this performance at EVO 2014. In the winners' quarterfinals pool, he defeated HugS 2-0, J666 2-0, and ChuDat 2-0, before losing to Mango 1-2 in a set that went down to the last stock. He made it into the top 8 by defeating Plup 2-0, and then proceeded to eliminate Silent Wolf 2-1 in losers' top 8, including a 4-stock in game 3 that took only 56.51 seconds to complete. Axe then lost to Armada 1-2 in losers' quarters in a set that went down to the last stock, placing 5th once again. By this time, many considered Axe to be one of the "Demi-Gods" (along with players such as Leffen, Hax, and Westballz), as he had taken sets off of three of the "Five Gods" (PPMD, Hungrybox and Mew2King), and individual games off of the other two (Mango and Armada). At Zenith 2014, Axe placed 4th in Melee singles. He lost to Wizzrobe 1-2 in winners' quarters, though he still managed to defeat Swedish Delight 2-0, The Moon 2-1, and Nintendude 2-1 to make it to losers' semis, where he lost a close set to Zhu 2-3. Axe also placed 2nd in Melee doubles with ZeRo, losing to Mew2King and Hax in winners' finals, then winning a close set against Zhu and Cactuar in losers' finals before losing to Mew2King and Hax again in grand finals. At the Apex 2015 qualifier Tipped Off 10, Axe placed 5th in Melee singles and 4th in Melee doubles, teaming with ESAM. In Melee singles, Axe beat Wizzrobe 3-1 to enter Top 8 in winners' side, but later lost to Hungrybox 1-3 in winners' semis, and to Colbol 0-3 in losers' quarters to end his run. At the Midwest major The Big House 4, Axe placed rather low at 9th in Melee singles, 5th in Melee doubles (teaming with SFAT), and 13th in Project M singles. In Melee singles, Axe defeated Colbol 2-1 to reach winners' quarters, but then lost to Mew2King 0-3. In the losers bracket, Kels performed a surprising upset on Axe, where Axe fell 1-3 and did not reach top 8. In Melee doubles, Axe and SFAT faced Colbol and DoH in winners' quarters and lost 0-2. They then defeated Zhu and Cactuar 2-0 to reach top 8, and Wizzrobe and Gahtzu 2-0 to reach losers' quarters. The team then lost to Leffen and Hax 1-3. In Project M singles, Axe was sent to losers' bracket by Hungrybox 1-2. He defeated DJ Nintendo 2-0 and VaNz 2-1 to reach top 16, but was then beaten by Seibrik 0-2. At the Apex 2015 qualifier Paragon Orlando 2015, Axe placed 7th in Melee singles and 7th in Melee doubles with Westballz. Axe was able to reach winners' quarters by beating Shroomed 2-0. He then faced Mew2King, where he lost 0-2 and was sent to the losers bracket. He was able to eliminate SFAT to reach top 8, but was later eliminated himself, by Leffen in a close 2-3 set. In Melee doubles, Axe and Westballz reached winners' quarters only to lose to Leffen and MacD 0-2. They defeated Wizzrobe and Gahtzu 2-0 to reach top 8, but then they were eliminated by Colbol and Harriettheguy. At a local tournament held by MVG, Axe reached winners' finals against Mew2King in Melee singles, and lost 1-3. He reached grand finals for a rematch, and was able to take 2 consecutive sets off of Mew2King, the second set being a 3-0. 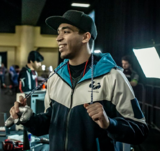 At Apex 2015, Axe placed a somewhat disappointing 13th place in Melee singles. He lost early in bracket to SFAT, beat Colbol 2-1, but then lost to Shroomed 0-2, being double eliminated by NorCal residents. At Sandstorm, Axe placed a phenomenal 3rd place in Melee singles, and 4th in Melee doubles with Forward. He was able to take down Leffen for the first time in winners' quarters 3-1. He then made an unexpected feat by defeating Mango 3-2 in Top 8. Axe was then defeated 0-3 by Armada, and eliminated by Westballz in a 1-3 set. In Melee doubles, Axe and Forward defeated Hungrybox and Silly Kyle 2-1 to reach top 8. The team was later defeated 0-3 by Leffen and MacD and sent to the losers bracket. Axe and Forward then beat Taj and Wobbles 2-0, and then were eliminated by Hungrybox and Silly Kyle in a losers' semis rematch. At the Eclipse tournament, Axe faced Armada in Top 8. He won the first and third game in a best out of 5 set, he went to game 5 to a last-stock match and was defeated 2-3. He finished 3rd in what was the largest European tournament of all time. Despite this he won the doubles tournament along side Plup in which they won 3-1 against Leffen and Ice. At DreamHack Winter 2015, he paired up with Hungrybox to win the doubles tournament. It was a joke within the Arizona and California Smash communities that there needs to be a tournament match to decide the best person named Jeff - SilentSpectre or Axe. Axe is the subject of a meme in the Melee community concerning his resemblance to pop artist Drake. This came about when someone in the Arizona region took a picture of Axe working at the department store Walgreens, then used that picture to make a page on Facebook entitled "Walgreens Drake", proclaiming that the two look very similar. People familiar with the Smash scene quickly found that page and pointed out that it was in fact the professional Melee player, and linked to that page on other social media, causing the moniker "Walgreens Drake" to become very widespread. After Axe 4-stocked Silent Wolf at EVO 2014, commentator Prog made a reference to this meme: "That was emphatic... that was amazing. Mortality! Are you watching? This boy, Walgreens Drake, says Take Care; you guys can Thank Me Later!" Axe has defeated 5 of the members of the top 6, defeating Mew2King at Zenith 2011, Hungrybox at MLG Anaheim 2014, both Leffen and Mango at Sandstorm and Plup at GENESIS 6 . He has also defeated PPMD at Pound 4, but PPMD was not in contention for "god status" at the time, with Axe also not counting the win. This page was last edited on April 1, 2019, at 01:53.